Over the last couple of months I've been busy working out the parametric representing the closed 'centre manifold' orbits of the L1 and L2 Lagrange points of the Earth-Moon and Sun-Earth systems. And I've just about finished. 5. station-keeping on the centre-manifold orbits. Without a map of the centre-manifold orbits its impossible to even begin to answer these questions (although tools like IMFD and Lagrange MFD) can provide some qualitative insight in some cases. Over the next couple of months, I'm going to begin to unfold the results of this mapping exercise. There is a fair amount of tedious maths, analysis and calculation sitting behind all of this - everything in the restricted three-body problem is more complicated than the Keplerian case - but the end result should be tools that allow one to answer the questions listed above. When working with these orbits, it is often hard to appreciate the scale of some of these orbits in relation to the Earth-Moon system. They are big. The end-to-end distance of the two orbits in the video is around 60,000 km. The red orbit is an example of a planar Lyapunov orbit; and the blue orbit is an example of a vertical orbit. In the video, the yellow line is the orbit of the Moon around the Earth; the white sphere is (obviously) the Moon; and the smaller (but more distant) blue sphere is the Earth. Now, these two orbits have been used as an example because the present a fairly clean demonstration of the mapping of centre manifold orbits. Using different parameter values in the mapping exercise, one could easily calculate the state vectors of a spacecraft on all of the other Lyapunov orbits - just as one calculate the state vectors of a vessel in a Keplerian orbit. Moreover, the full map of the centre-manifold orbits describes general Lissajous orbits and, of course, the much mentioned Halo orbits. This mapping of Keplerian orbits, together with the Lambert solver for Lagrange points describe, will allow one to plan transfer between centre-manifold orbits of the same Lagrange points; and help design transfers between the centre manifold of different Lagrange points (e.g. L1-L2 transfers). Well, that's the plan. But setting all of this out in a useful fashion is going to take some time - but for me at least the effort will have been worth it. Just as a bit of an addendum, here is another short YouTube video showing a mix of vertical and planar Lyapunov orbits around both L1 and L2. In all, eight centre manifold orbits are shown. Aside from the fact that is fun to make these videoettes, the main purpose is to help visualise the shape, location and scale of some of these centre manifold orbits. So far, I haven't focused on Lissajous (and Halo) orbits, because the vertical and planar orbits illustrate the two basic kinds of motion that these orbits can have - an 'in plane' oscillation and a 'vertical' oscillation. Lissajous orbits are just a mix of these two kinds of motion; and a Halo orbit is just a special kind of Lissajous orbit. Last edited by MontBlanc2012; 08-30-2018 at 02:37 AM. Ok, I think I've now completed the mapping of the centre manifold orbits of the L1 and L2 points of the Earth-Moon system. For the mathematics aficionados in the Orbiter Land, this 'mapping' consists of calculating the coefficients of a Lindstedt-Poincaré expansion of the centre-manifold to high(ish)-order. In effect, this parameterises the solution of the equations of motion in the vicinity of a Lagrange point in terms of a large(ish) number of cosine and sine teams - much in the same way that VSOP87 ephemerides system works. In keeping with the colour convention of some earlier videos, the Halo orbit is green. A planar Lyapunov orbit (red) and a vertical Lyapunov orbit (blue) is also shown for comparison. Again the Moon's orbital path is shown in yellow; the white sphere is the Moon (drawn to scale); and the blue sphere is the Earth (also drawn to scale). Now that I have the Lindstedt-Poincaré solutions, I'm going to shortly start a sequence of threads that , hopefully, will make this solutions more accessible (and useful) to others. Thanks! A very interesting topic. I'm trying now to get deeper into the subject too. There is a transfer from a planar Lyapunov orbit L1 to L2, e.g. Last edited by Ajaja; 09-02-2018 at 11:08 PM. Yes, there ought to be ballistic transfers from L1 planar Lyapunov orbits to L2 planar Lyapunov. 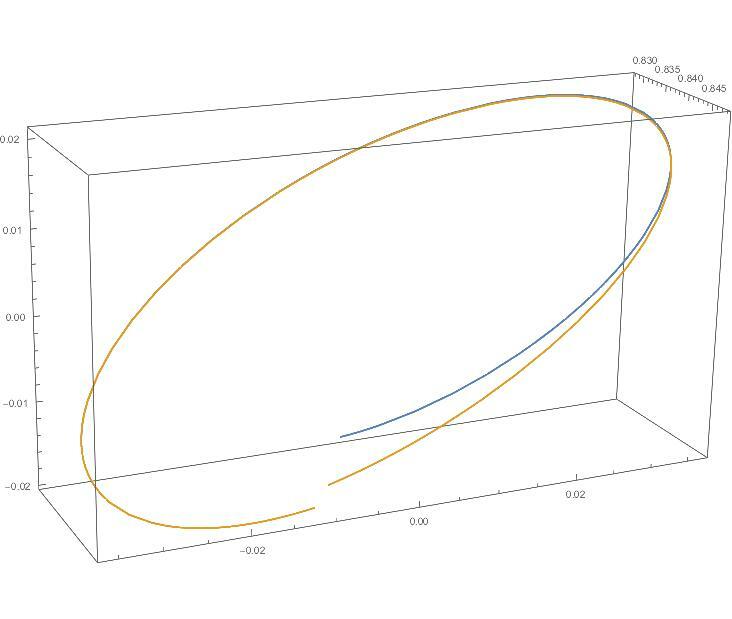 As you've worked out, one ought to leave an L1 orbit on an unstable manifold trajectory and this should connect with a stable manifold tractor leading to an L2 orbit. The velocity discontinuity at the point of connection of the unstable and stable manifold solutions looks a little problematic - but I expect that with suitable optimisation much (if not all) of that velocity discontinuity can be eliminated. Anyway, for the time being, I'm going to keep things simple and just focus on locking a vessel into a centre-manifold general Lissajous orbit so that it can maintain that orbit indefinitely. fyi - I now have the coefficient tables for the 7th-order general centre manifold solutions of the Elliptical Restricted Three-Body Problem (ER3BP) for both EM L1 and EM L2. As such, and as specific cases of Lissajous orbits, these tables describe general planar Lyapunov, vertical Lyapunov and Halo orbits of the elliptical theory. 3. a second scale parameter for motion in the out of plane direction. I would post these spreadsheets now for general access but September is going to be a busy month for me and I doubt I'm going to have much time to write up explanatory notes on these tables until early October. It makes sense, I think, for me to hold off releasing until I have some written 'User Guide' notes to accompany them. The orange line is the centre-manifold solution. And the blue line is the integrated solution. The scale of the graph is such that the Earth-Moon distance is exactly 1. After a full orbit, the integrated solution is well on its way to leaving the centre-manifold of the Lissajous orbit - as one might expect since all of these orbits are unstable. I have a suspicion that the most efficient L1->L2 transfer trajectory between symmetric planar Lyapunov orbits should look like this. 1. In the CR3BP model, for each planar Lyapunov orbit there is a conserved quantity which we will call for the L1 Planar Lyapunov orbit and for the L2 planar Lyapunov orbit. 2. As one considers larger planar Lyapunov orbits, both and . In effect, orbits become more 'energetic'. Find the particular size of planar Lyapunov orbits are the same such that . 3. Now the stable and unstable manifolds leading to and away from the L1 and L2 orbits will also have the same values of . Choose an arbitrary connect point on the y-axis passing through the Moon and find the unstable manifold from the L1 orbit (with conserved quantity ) that passes through the connect point . Similarly find the stable manifold for the L2 orbit (also with conserved quantity that leads from to L2 orbit. 4. Because the stable and unstable manifold trajectories connecting with also have the same conserved quantity, , the speed of a vessel on the unstable manifold and the stable manifold must be the same. There may however, be an angle offset at the point . 6. If is such that one does not need to complete one full circuit around the Moon in order to get the required velocity matching, then the ballistic transfer will look closer to your first diagram. If you need one or more full orbits of the Moon in order to get the required velocity matching, then it will look closer to your second diagram. Last edited by MontBlanc2012; 09-05-2018 at 01:31 AM.